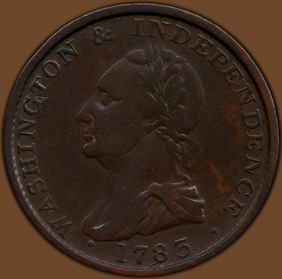 Obverse: WASHINGTON & INDEPENDENCE . 1783 . Comments: Listed by Vlack as 13-J and by Fuld as WA.NC.1783.3. This is considered to be one of the original Ingram strikes. Note the initial I in the V shaped area between the toga folds above the 3 in the date. The obverse can be distinguished in that the main toga fold ends in a point over the numeral 7 of the date, on all other varieties the point extends to the 1. There is also some defective punch work on this die. In the legend in INDEPENDENCE the three final E's are weak at the top with the last being the most broken. Also, in the same word the the second D is weak and the top of the C is missing. 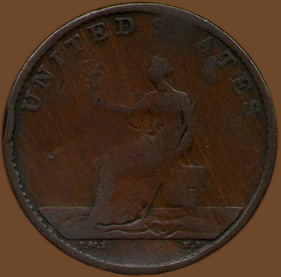 Some later examples show the NDEN recut. Also note the bottom of the 3 in the date is missing. The reverse can be distinguished as follows. This is one of the varieties in which the liberty cap touches the A. 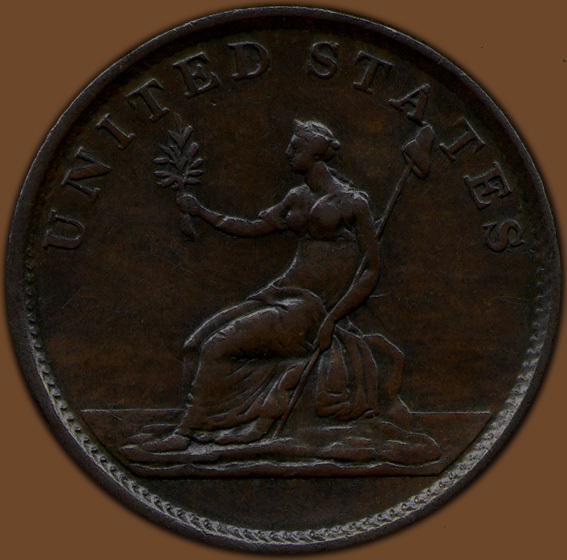 On the branch held by Liberty the second leaf from the bottom on the left has a die break at the end appearing as a small comma at the end of the leaf. On the second leaf up on the right side there is a very small die break to the left of the leaf appearing as a small dot near the branch. On the top half of this example the beaded edge is flattened. Comments: This variety is listed by Vlack as 20-P and by Fuld as WA.NC.1783.19. This is one of the varieties with a button fastening the two sectons of the toga. Breen calles these varieties contemporary imitations made in Birmingham but not by Ingham at the Soho mint. Vlack considers them original. This example is an early strike, produced before several of the die breaks metioned by Vlack had developed. 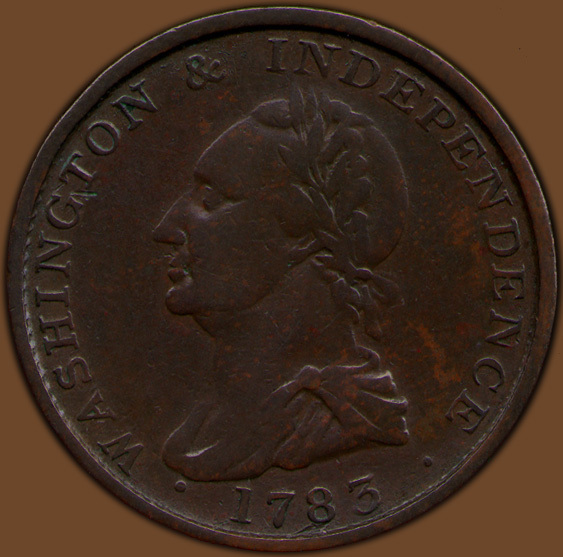 On the obverse there is a small die break at the top of the final serif in the N in WASHINGTON. Also, the top of the final stroke of the third N in INDEPENDENCE is defective. The reverse can be easily identified but the small die break that appears as a dot inside the bow of the D in UNITED. 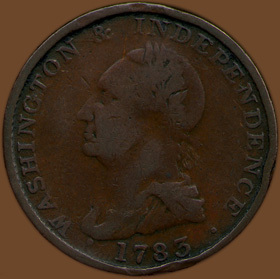 This reverse is only joined with obverse die 20. Comments: Listed by Vlack as 20-P and by Fuld as WA.NC.1783.19. This is one of the varieties with a button fastening the two sectons of the toga. Breen calles these varieties contemporary imitations made in Birmingham but not by Ingham at the Soho mint. Vlack considers them original. 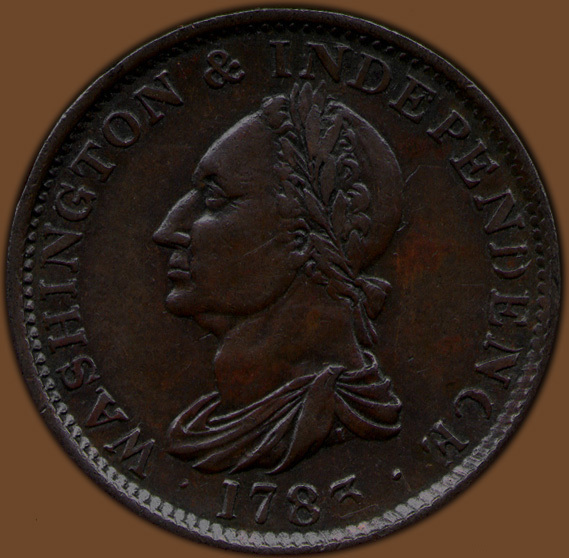 On the obverse there is a die break at the top of the final serif in the N in WASHINGTON extending down to the bottom of the & sign. The reverse can be easily identified but the small die break that appears as a dot inside the bow of the D in UNITED. This reverse is only joined with obverse die 20.